Painting by John Emms. 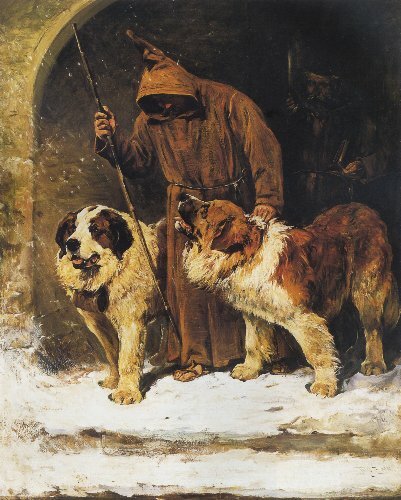 Two St. Bernards, rescue dogs, with brandy barrels around their neck. According to legend, the brandy was used to warm the bodies of trapped people in avalanches or snow. For another reason, however, Bernard’s name will forever be famous in history. Since the most ancient times there was a path across the Pennine Alps leading from the valley of Aosta to the Swiss canton of Valais, over what is now the pass of the Great St. Bernard. This pass is covered with perpetual snow from seven to eight feet deep, and drifts sometimes accumulate to the height of forty feet. Though the pass was extremely dangerous, especially in the springtime on account of avalanches, yet it was often used by French and German pilgrims on their way to Rome. For the convenience and protection of travelers St. Bernard founded a monastery and hospice at the highest point of the pass, 8,000 feet above sea-level, in the year 962. A few years later he established another hospice on the Little St. Bernard, a mountain of the Graian Alps, 7,076 feet above sea-level. Both were placed in charge of Augustinian monks after pontifical approval had been obtained by him during a visit to Rome. 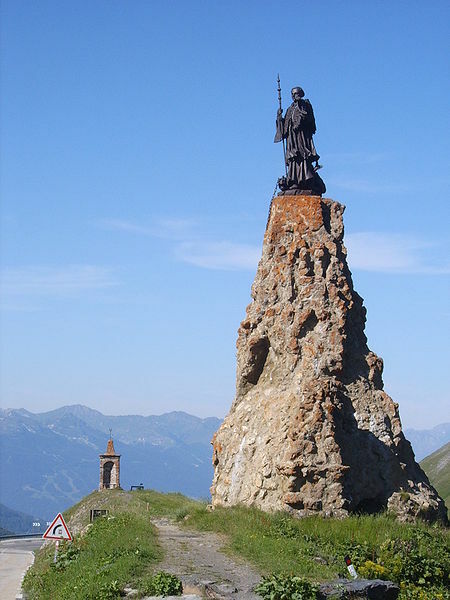 Statue of St. Bernard at the Little St Bernard Pass. The last act of St. Bernard’s life was the reconciliation of two noblemen whose strife threatened a fatal issue. He was interred in the cloister of St. Lawrence. 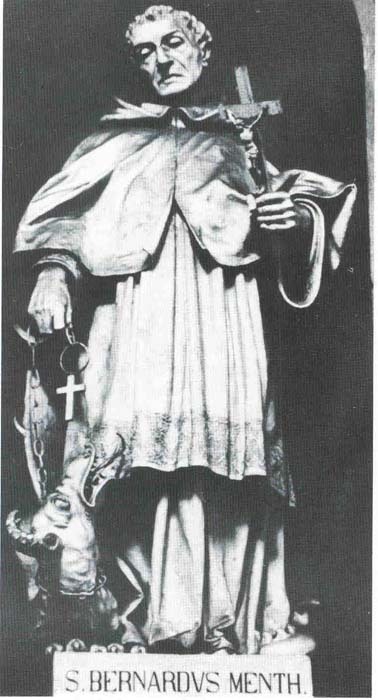 Venerated as a saint from the twelfth century in many places of Piedmont (Aosta, Novara, Brescia), he was not canonized until 1681, by Innocent XI. 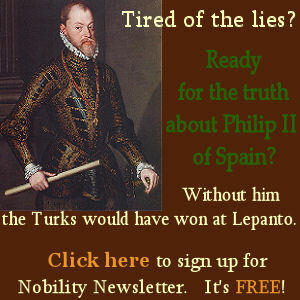 His feast is celebrated on the 15th of June. Is there anyone who enjoys being out in a storm? A blizzard? A day with cutting winds and Arctic temperatures? Yet this is what the monks of the monasteries founded by St. Bernard of Menthon do day in and day out. Their dogs are gentle giants. 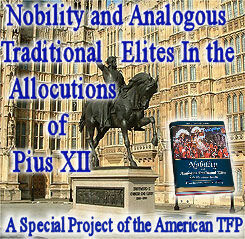 The trained work they carry out provides us with a glimpse into the good and generous heart of the noble founder of these institutions which have become world famous, both for their originality and spirit of sacrifice in the service of others–two driving characteristics of the nobility.